This utility is a COM add-in or add-in (.mdb) programmed in Microsoft® Visual Basic® for Application (VBA) that makes it possible to capture a number in Microsoft® Access®, configure its respective SpellNumber (write-out number, as in check writing protection) through a popup user interface, and insert it back in Access or send it to the Microsoft® Windows® clipboard to be immediately pasted into any Access place or into another Windows application. It consists of only one file, the AccessSpellNumber.dll, which is about 160 kb in size and can be installed automatically. Except for the DLL, no another setting is saved in the Microsoft® Windows® Register. Its setting is saved in AccessSpellNumber.ini file that is created and maintained by the proper utility. You can uninstall it totally and automatically, leaving no mess on your Windows Register or disc. 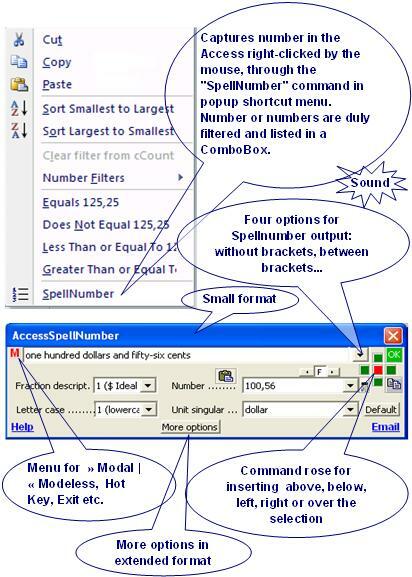 - Before inserting and/or sending to clipboard, the user can configure the desired SpellNumber inserting or selecting options listed in the below ComboBoxes of the popup interface. - Number ComboBox: Cardinal number, with or without fraction, to spell out. - Unit Singular ComboBox: Unit name entry in the singular. The suggestion list of unit names where the first is default can be edited and saved by the user. 8 - Spells the fraction in centavo/centavos only. Ideal for coins. 4 - ALL UPPER CASE. True (Yes, 'one thousand') or False (Not, 'thousand'). - Unit Plural ComboBox: Unit name in the plural (Optional - In the lack the pluralization will be done automatically from unit name in singular, thus this only is necessary when the desired plural diverges from the language default as defined in the code). - Occupies less than 150 Kb when installed. Tested in Microsoft Access 2000, 2002(XP), 2003, 2007, 2010 (32-bit), 2013 (32-bit), and 2016 (32-bit) in MSI-based and Click-To-Run installations of Office 365™ cloud-based services. See also for Microsoft Excel®, for Microsoft PowerPoint®, for Microsoft Word, and, if you develop in VBA, fSpellNumber() function source code.